Good news for people allergic to wheat and bakery products made up of wheat flour and to those countries which does not have wheat grown in their country . 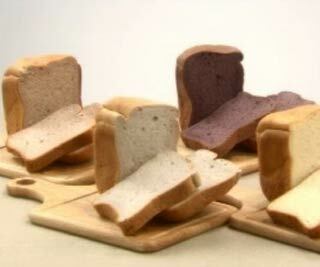 Japanese bakers have developed rice bread which is gaining popularity among Japanese people . TOKYO : Rice has always been a main staple in the Japanese diet, but the consumption of rice has been falling in recent years - hurting the rice industry. Making bread with rice flour is gaining popularity in Japan. Hisako Sato, a baker at KiNaRi, decided to try it out. She said: "For Japanese, rice is something always there. If I can use rice to bake, I want to try using it." Hisako uses organic rice from Akita in northern Japan, her hometown. One drawback of rice bread is that rice flour is more expensive than wheat because of the higher grinding cost. But now there is an alternative - making bread from the readily-available rice grain. The manufacturer of one machine claims it is a world's first. Chie Ito, who works in the Marketing department at Sanyo Electric, said: "Most of our wheat is imported. We hope that more people will consume rice harvested in Japan in various ways. So we have decided to propose a new eating style using rice in bread." One cafe uses the machine to make its popular rice bread. Its secret recipe consists of rice, sugar, a tinge of salt, dry yeast and shortening. Its rice bread comes with toppings such as small fish jako and fried burdock roots. One customer said: "It is nice to have such toppings. It can even be served with seasoned seaweed paste, and spicy cod roe." For those who are allergic to wheat, it is believed that rice bread makes a great alternative. According to Japan's Agriculture Ministry, the consumption of rice has halved in the last 50 years to about 59 kilogrammes per person a year. And the food sufficiency level has fallen from 76 per cent to 40 per cent. Now, the government is counting on rice bread to rescue Japan's dwindling rice industry. MILLTEC Machinery Pvt Ltd is the leading technology providing company for rice milling, Roller flour milling, Maize (corn) milling and pulses processing plants.Rice Milling Machinery, Rice processing equipments, Rice milling Technology, Rice milling equipments, Paddy processing machinery,Rice machinery manufacturer, service provider, Manufactures, exporters,MILLTEC Machinery Pvt Ltd, in bangalore, India.Rice Milling, Rice Machinery, Rice milling machinery exporters, Rice processing equipments manufacturers, Rice milling Technology service provider, Rice machinery manufacturer, Rice milling equipments manufacturers, Paddy processing machinery manufacturers, MILLTEC Machinery Pvt Ltd, Bnagalore.India.